These new-to-market Clothes Moth Killer Cassettes are an exceptional moth control product for the protection of clothing and fabrics in drawers and wardrobes. Each cassette emits a powerful moth-killing insecticide (1.3% w/w transfluthrin) which eradicates moth eggs and larvae as well as adult clothes moths, preventing damage to your woollens, cashmeres and silks. Pest Experts Clothes Moth Cassettes play an essential role in any comprehensive moth prevention strategy, and are ideal to maintain long-term moth control following a clothes moth treatment to eradicate an initial infestation. These Moth Cassettes have a fold-out hook for hanging over wardrobe clothes rails, but they can also be placed between clothing or bedding in drawers and storage chests. Each Cassette has a date guide to indicate when it needs replacing after 6 months. Unlike other comparable products which are strongly scented, these Cassettes are completely odourless, ensuring that your wardrobes, drawers and fabrics remain fresh and odour-free as well as being protected against moth infestation. One twinpack will provide protection to a space of 1 cubic metre, sufficient for a standard wardrobe of approx 2m (H) x 1m (W) x 0.5m (D) or 2 large drawers. 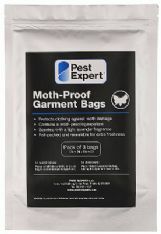 For a comprehensive moth treatment package, see our best-selling Clothes Moth Kits, which contain a range of our most effective products for moth control, including Formula ‘C’ Clothes Moth Killer Spray and Formula ‘P+’ Power Foggers, as well as Moth Cassettes, Moth Killer Strips and Clothes Moth Traps. Our Standard Clothes Moth Killer Kit provides a combination of the very best clothes moth control products, perfect for the treatment of a clothes moth infestation in one double or two single wardrobes. 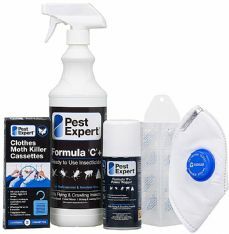 Including clothes moth products from Pest Expert, this Kit contains everything you need to get rid of clothes moths and maintain control for up to 6 months! All our Clothes Moth Killer kits are supplied with a step-by-step advice sheet, to enable you to carry out a professional clothes moth treatment. For full details of this pack, please click on More Info. Ideal for use in multiple wardrobes. Cannot believe how effective they have been at killing moths and even their larvae! I was unlucky enough to buy a jumper which must have contained moth eggs. I followed the advice of the sales team and placed the jumper in the freezer and once it was out, ensured that papers and cassettes were in the wardrobes and drawers to prevent it spreading. Good advice! We were advised to buy these to prevent any infestations appearing. No sign of moths so far. I bought the kit when I noticed damage in one of my jumpers. After applying all of the insecticides this has managed to keep my jumpers safe from further damage! Because I use moth killer from MothKiller! Around June/July I put a Clothes Moth Killer Cassette in every drawer and 2 in the wardrobe, and have never had clothes moth damage. I reccomend you do the same. 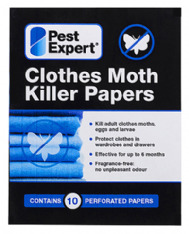 Having used MothKiller for several years I have always found that MothKiller's prices are good, the delivery is prompt and the order is complete. Excellent service Quick despatch, items as described, good quality, reasonable prices. I could not find anything against moths in the stores as fast as my order arrived! Ordered on Sunday night, delivered Tuesday morning. mothkiller Mothkiller has a user-friendly site so is easy to use. Products good, and service very prompt and efficient. Instant response and rapid delivery - The service was rapid and the product just what I wanted.